Periodically, Jim Comey invites a group of select journalists in for lunch and eats them alive with his charisma and unsubstantiated claims. The first I noticed came when Comey made some false claims about National Security Letters, without a single journalist correcting him. More recently, Comey claimed FBI had arrested 10 people with ties to ISIS, only two of whom have every publicly appeared. In this week’s edition, Comey got passionate about a claimed spike in crime. And in unusually passionate remarks, the FBI director said he was “very concerned about what’s going on now with violent crime and murder rates across the country,” in cities as disparate as Omaha and Milwaukee. At least in this instance, journalists are getting less credulous, because most (though not CNN) reported that in fact the crime stats released this week show a decline in crime, not a spike, even while they reported that violent crime in “many” cities has spiked. 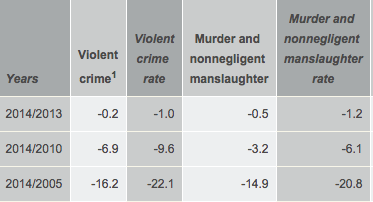 Newly released federal data suggest a slight dip in violence across the nation in 2014. But Comey said those numbers may not be capturing what’s happening on the ground today. He’s been hearing similar concerns from police chiefs, he said. Earlier this week, the FBI released data showing violent crime dropped slightly in 2014, but many big city police departments have reported significant jumps in shootings this year compared with last year. None I saw, however, pointed out that the claim of a spike in “many” cities stems from a persistent propaganda effort that has been debunked as cherry-picking. Yes, there are a few cities with alarming spikes in violence, but they should be examined as cities, not as a trend that the FBI’s own data shows is moving in the opposite direction. The spike in crime made him want to be “thoughtful” on criminal justice reform, Comey added. “My strong sense is that a significant portion of the change in our world since I was a prosecutor in New York in 1987 is due to law enforcement, but I’m sure there are lots of other things [going on],” he said. “I just want to make sure that as we reform — first of all, we’re grateful that we actually have the space and time to think and talk about sentencing better, rehabilitating better, and [that] is a product of hard work over the past 25 years — but as we do it, are very, very thoughtful about where we used to be and how we got from that point to here,” Comey said. As with encryption back doors, the data is not there (on that issue, DOJ simply doesn’t collect data on how often encryption prevents it from accessing data). But that’s not going to stop him from cautioning against criminal justice reform.